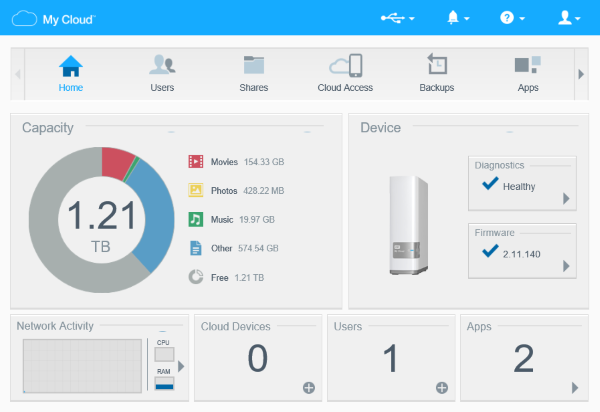 The Dashboard on a My Cloud device allows a user to access the device's internal settings, options, and features. If this is the first time using the device or the device has recently been restored, please follow the instructions in Answer ID 10439: How to set up a My Cloud Storage device. Important: Screen shots may vary depending upon My Cloud device. Important: If the My Cloud device name was changed, please use that name instead of 'WDMyCloud'. If the name (or IP Address) of the device is unknown or the Dashboard is not accessible, the My Cloud device can be reset by following the instructions in Answer ID 10432: How to Reset a My Cloud Device. If the device was set up using mycloud.com/setup, please enter the device Username and Password created during the setup process. If this information is not available, the device needs to be reset in order to log in to the Dashboard.